I wanted to see how effective it would be to ask new optins to confirm their email address in a multi-attempt reminder sequence. My hypothesis was that multiple attempts would increase response rates, and if true, that this case study could be used as justification for building repetition into all automated messages where response was crucial to conversions. I've been using automation tools for many years, so setting up this simple experiment was easy. Triggered automation software allow you to do so much more than simple follow-up. These tools are used to guide prospects through complex sales funnels using if/then logic. In the diagram above, prospects were sent an email to ask them to confirm their request. 'IF' the prospect did not confirm on the first request, 'THEN' a 2nd email was sent to remind them to take action. The 2nd reminder improved confirmations by a whopping 47%. When I added a third reminder to the sequence, it improved confirmations by an additional 16%. I always build persistence into automated follow-up sequences that I design for myself and clients, but had never run an actual case study. Am I glad I did! I was shocked at how these multiple reminders resulted in a combined increase of 66% additional confirmations. This is a break-through case study because it confirms that many non-responders are still interested. Their failure to act on your first message has nothing to do with disinterest. If we give up after the first try, we miss out! The numbers are even more significant when you look at the big picture. If email confirmations were part of your process, consider that it is just the first step in the funnel. Those numbers can go up exponentially as prospects move through your funnel because the gains are cumulative at each step. It is very realistic to expect a 100+% increase to your bottom line if you are diligent at optimizing conversions at each incremental step in your funnel. 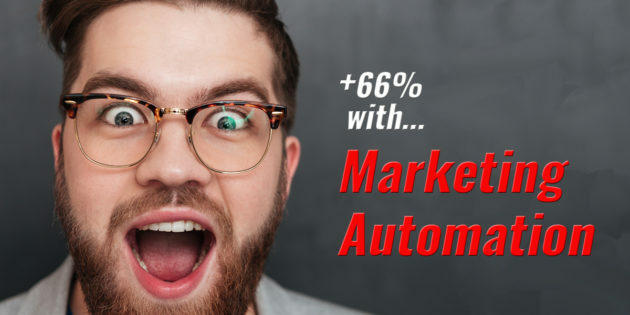 I have been using marketing automation since 1992 and on average, I would say it has boosted profits by at least 300-400% in almost every business I have run. I've started fifteen companies, taken two of them public and have built close to a thousand marketing-automation systems. I can't live without automation! And this case study confirms the power of persistence. You need to be wise in how you go about this to avoid being overly obnoxious. But as they say, "you can't turn someone off who is already off". When you are constructing your sequences, be sure to remind yourself that a certain amount of repetition is necessary to pull in the stragglers. You can activate non-engagers simply by being persistent. If you like the idea of increasing your response rate by 66% using the method above, (or even 47% for only one additional attempt), then you know what to do! Benny is available to help. Need advice? click the button below.